Visitors know Illinois for many different things—a great city, Land of Lincoln, charming towns, towering cornfields, rivers and lakes. Few expect what they find at Starved Rock State Park. Take a break sometime soon and visit the remarkable park. Mission Oak Inn, a country B&B just south of the park, is a great place to stay during your visit. Starved Rock State Park is an anomaly in the flatlands of Illinois, a striking area of towering trees, deep canyons and bluffs giving way to panoramic views. No matter the season, it offers a stunning variety of landscape and a wonderful playground for outdoor enthusiasts. Opened as a public facility in 1912, Starved Rock State Park, was an instant attraction, with attendance reaching 75,000 visitors that year. Back then, guests arrived by rail and ferry. In the 1930’s, a white, pine log lodge was constructed by the Civilian Conservation Corps. Cabins were soon to follow. Today, over two million people visit the park annually, hiking its many trails, riding the historic trolley, and taking in the unique beauty of the surroundings. For those who’d like to get exercise and learn more about the park, there is the Hike & Lunch program. Hikes, which are $18 per person and led by experienced guides, are scheduled from April to November. Another way to enjoy the park is on one of the Trolley Tours, which include a trip to the locks and downtown Utica. The park has a wonderful Visitor’s Center with interactive displays, and a variety of places to dine throughout the day in the Starved Rock Lodge. Open 6:00 a.m. – 9:00 p.m.
After a busy day with other tourists, you’ll find Mission Oak Inn a restful and quiet place to stay. Set on 120 acres, the B&B has two cozy rooms with fireplaces and whirlpool tubs—just what a tired guest needs! Full gourmet breakfasts are served at tables overlooking a private lake. 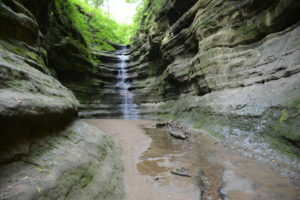 PARK PHOTOS COURTESY OF STARVED ROCK STATE PARK. 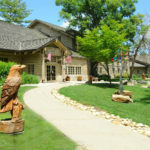 This entry was posted in Hiking, Illinois Bed and Breakfasts, Outdoor activities, Touring Illinois and tagged Illinois Bed & Breakfasts, Illinois Travel, outdoor activities, Starved Rock State Park by admin. Bookmark the permalink.